In recent situations where great efforts to address environmental problems such as global warming are required on a worldwide basis, the Asian countries with remarkable economic growth are actively trying to take environmental and energy-saving measures, aiming to well balance between their economic development and environmental protection, shifting from their traditional policies focusing on economic growth. 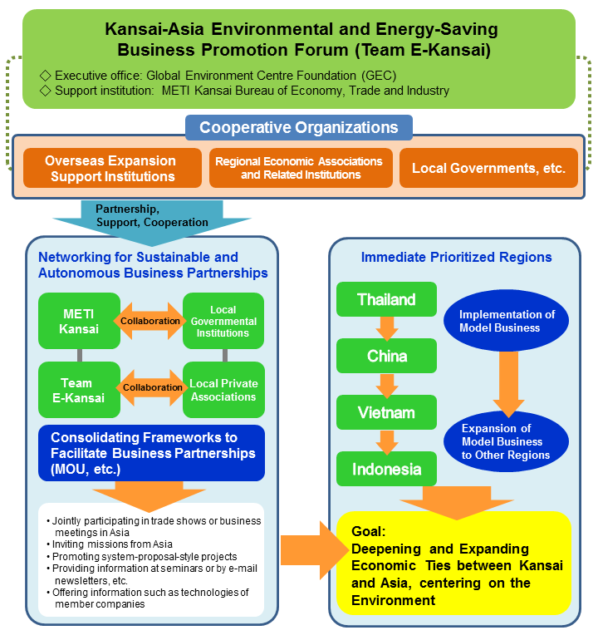 Under these circumstances, we, “Team E-Kansai” (Kansai-Asia Environmental and Energy-Saving Business Promotion Forum), are supporting our member companies which target the Asian region for their business expansion, by providing them with a wide variety of support options such as holding local trade shows, business meetings or business seminars. To strengthen relationships between Kansai and Asia, centering on the environmental issues, through creating networks for sustainable business partnerships with Asia, as well as to facilitate the environmental and energy-saving business of the Kansai-based companies in Asia. The public institutions to support overseas expansion such as Japan External Trade Organization (JETRO) and The Overseas Human Resources and Industry Development Association (HIDA), the industrial associations such as Kansai Economic Federation (KANKEIREN), The Osaka Chamber of Commerce and Industry (OCCI) and Kansai Branch of The Japan Society of Industrial Machinery Manufacturers (JSIM), local governments and any other various organizations are participating in this Forum as cooperative organizations. They are supporting the member companies through various kinds of support options, such as giving advice to the activities of this Forum, as well as giving support or cooperation to those companies, or mutually complementing among themselves, in collaboration with the programs, etc. of each organization. Currently, we are focusing on Thailand, China, Vietnam and Indonesia as prioritized regions, aiming to deepen and expand economic ties between Kansai and Asia, centering on the environment.